The world is gradually unravelling new ways to use Blockchain technology. While most people would easily think of cryptocurrency and finance every time the word “Blockchain” is mentioned, there is more to this technology. Industries such as agriculture, energy and art are integrating Blockchain into their operations. Another unsuspecting player joining the bandwagon is online gaming. Many projects are already picking up. Home to about two billion users and projected growth in revenue from USD $94.4 billion to $128 billion in yearly volume by 2020, the gaming sector is truly thriving. What could be more thrilling in playing online games than getting continuous access to parallel gaming universes? Blockchain’s distributed ledger will make it possible for you, as a gamer, to use your characters and items across several games. It is possible because all your data will be verified through smart contracts. Perhaps you may ask: how does it work? Blockchain copyrights you data and provides a better option of storing data that will be used in games in digital assets form. Furthermore, this technology will make it possible for the many gaming companies to join hands and create parallel gaming universes. The gaming companies will have their terms and conditions fortified via smart contracts, allowing loyalty across all inter-linked titles to increase. Creating new ways of using virtual items in and out of games which will increase these items’ functional value. Creating platforms that allow you, as a player, to sell your virtual items in fiat cash will strengthen their economic value. Creating a virtual space that promotes trading, gifting and sharing of virtual items will increase their social value. The increase in value will lead to the change in the name of the game items from virtual items to digital assets. You will also be happy to know that introducing encrypted Blockchain ledgers to the gaming industry will go a long way in guaranteeing you safe and secure storage of your game items. As long as your data is in the Blockchain, you can say goodbye to any witty hacker’s dream of accessing it. Not only does a hacker have to ensure that the right nodes are hacked but also the timing has to be impeccable. There is also the impenetrable encryption to decipher through. And that is just the first step of the several hubs the hacker will have to find and hack simultaneously. As such, Blockchain permanently ensures the safety of your virtual items. Revenue lost to fraud is one of the widely noticed vices on the internet. The gaming industry has not been spared with one out of every 7.5 virtual items succumbing to fraud. Blockchain technology will ensure eradication of this menace, saving the gaming industry billions lost in revenue annually. As you already know, the gaming industry is huge. While it is possible to pay for your games through the use of fiat currencies, there is an expensive fee that comes with it. Blockchain will allow you, as a user, to make payments, no matter how small the amount is, without involving credit or debit card companies. And since it is decentralized, fees implemented here are infinitesimal. Also, this technology fortifies payment in a manner that scammers cannot bait you, as a gamer, anywhere. In other words, in a Blockchain system it’s close to impossible to steal information or even manipulate the market. The problem with heavily regulated economies or a government bans is that it results to black markets, and this is bad for everybody. Not only do game developers lose the capacity to control parameters of the trade and therefore forfeit potential revenue, but it also exposes users to the risk of being scammed. Blockchain does not require any policing. Blockchain technology will enable developers to collect ongoing royalties for items on trade across the gaming ecosystem. As a developer or server owner, you can also decide whether to allow the trading of items with no restrictions or stop the selling of the assets. Games providing cheaper power-ups for users will prompt more users purchasing the items. Users’ ability to limit their expenditure on gaming platforms through subscription service that start-stop and calculate time spent. Setting automatic option in-game transactions can allow games to automatically transfer money in the form of assets. The results would be a great turn around in monetization goals, as it would no longer be about serving the few rather than the many. By 2021 it is expected that the gaming industry revenue would have exceeded $132 billion dollars. Since Blockchain is open-source, game developers can create rare virtual assets or customize certain assets such as armors, swords, and other in-game cosmetics to make them more valuable. An excellent example that uses this technology is the Crypto Kitties game. Crypto Kitties, an easy independent game, uses blockchain to store cute cats that, as a user, you can obtain and trade. In its first week, Crypto Kitties was met with unexpected success by processing millions of USD in transactions, with “Genesis Cat” their top selling cat selling at USD 115,000. Proof of limited supply prompted the amazing demand for these virtual items. Last but not least, voting features are quite popular within the online gaming community and gaming servers. It comes in handy in ranking; games, teams and many other items. The current menace of corruption and manipulating of votes results to unreliable feedback from the voting system. Blockchain technology can be applied as a decentralized smart contract that makes it difficult to tamper with the voting system. Blockchain’s public nature makes manipulating votes quite hard and also acts as an impeccable shield against corruption. Democratizing voting in games could create another level of gameplay that was previously seen as an impossible task. As you can see, the use of Blockchain will have a massive impact on all aspects of the gaming world. Tokenization of virtual goods, improving betting as well as payments and are just but a tip of the iceberg of the many benefits that are expected. 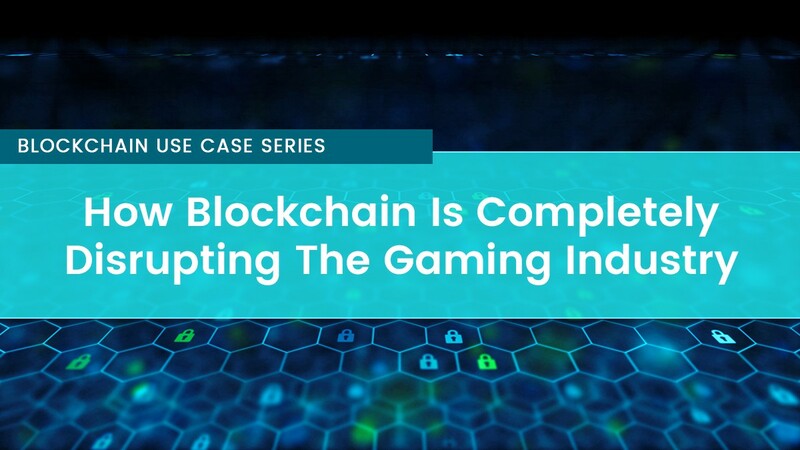 And as the Blockchain technology evolves, it will revolutionize the gaming sector further. Perhaps you should follow closely and enjoy the new set of gaming innovation that this technology brings forth.